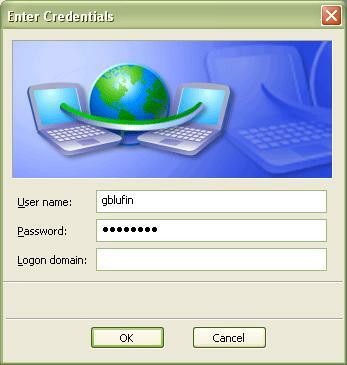 You must have Administrator privileges on your PC to successfully complete these steps. If you're using the wireless card manufacturer's software program to control your wireless, see alternate instructions. If your machine is normally connected to the Active Directory, skip to step 5. 1. Check for encrypted wireless service on campus. Click View Wireless Networks. Look for "UCSD-PROTECTED," but do not select it yet. If you see this option, you can use encrypted wireless in this area. 2. Configure your PC to use the encrypted wireless. 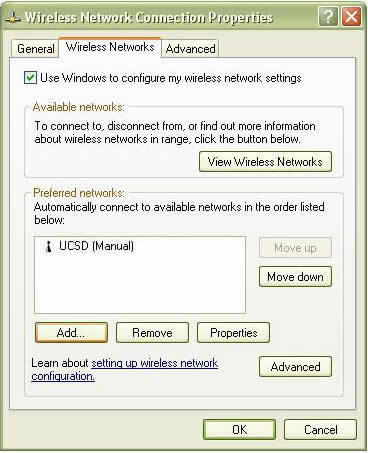 In View Wireless Networks, click the UCSD-GUEST entry if you are currently using this network and disconnect from it. In the left column under Related tasks, click Change the order of preferred networks. The Wireless Network Connection Properties window will open to the Wireless Networks tab. Click Add located under Preferred networks. 3. Configure the Association tab. 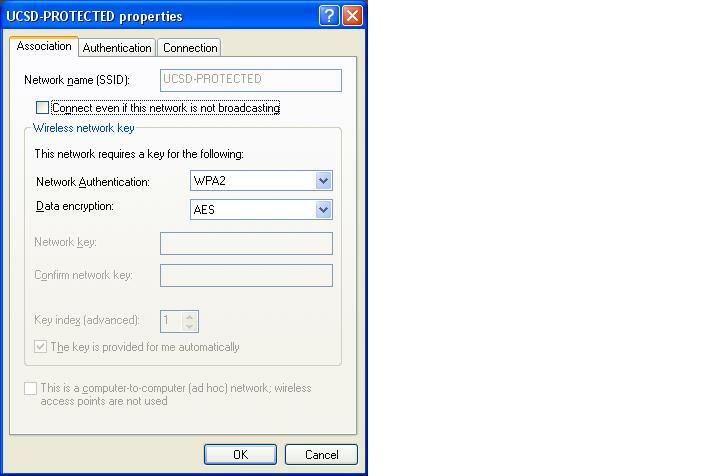 The Wireless network properties window opens to the Association tab. In the network name field (SSID), enter UCSD-PROTECTED. Set the Network Authentication to WPA2. If WPA2 is not available on your computer, select WPA. Set the Data Encryption to AES. If AES is not available on your computer, select TKIP. 4. Configure the Authentication tab. 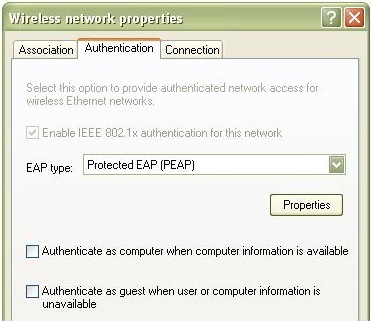 Select the EAP Type drop-down menu and select Protected EAP (PEAP). 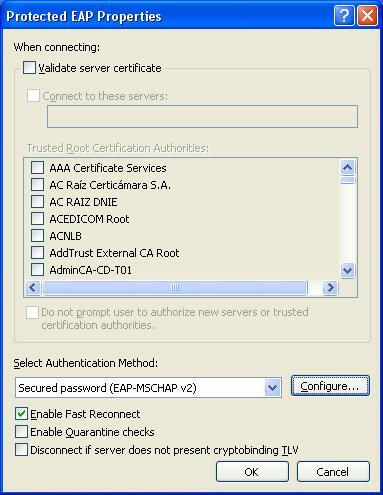 Select Authentication Method should be set to Secured password (EAP-MSCHAP-v2). 6. Complete the configuration of your PC. 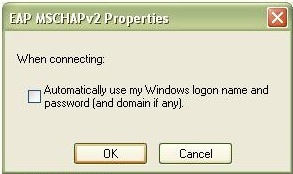 Uncheck Automatically use my Windows logon name and password. Click OK on all remaining windows. 7. Connect to the protected wireless network. When you are within range of a wireless network access point, a message balloon will appear next to your clock asking you to provide additional information to authenticate to the network. Click inside the balloon and supply your Active Directory username and password (no domain is needed). 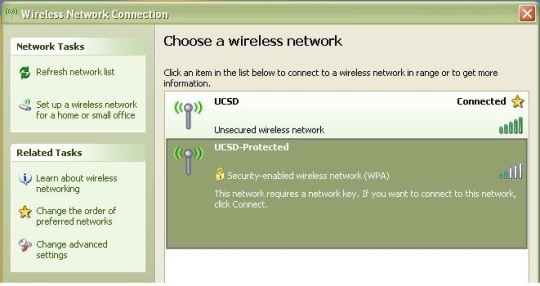 It may be necessary to turn your wireless off and back on again in order to detect UCSD-PROTECTED. If you continue to have problems, make sure you have installed all available patches for your wireless card (check the manufacturer's web site). For more information, contact the ITS Service Desk, (858) 246-4357 or ext. 6-HELP, or see Wireless Overview.